ModBargains.com offers the lowest prices online for all F30 BMW 328i AFE Magnum FORCE Intakes. SAVE Online, or call 714-582-3330 to speak to one of our Experienced Modification Experts Now. This Stage-2 cold air intake system resulted in 11 max horsepower, 15 lbs. x ft. torque and out-flowed the factory intake by 38% on the 2012-2014 BMW 328i (F30) N20 Turbo. 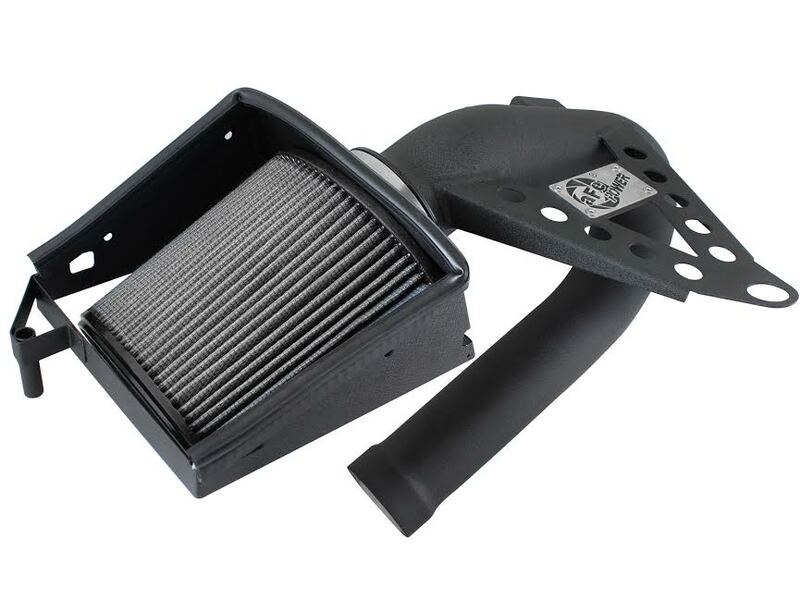 This system includes a durable 18-gauge, powder-coated heat shield and features a washable/ reusable conical Pro DRY S air filter for maximum flow OR oiled Pro 5R filter. The Pro DRY S air filter uses three layers of progressively finer mesh synthetic "oil-free" media to provide maximum airflow for the best performance results. A 3 inch one-piece mandrel-bent wrinkle-black powder coated intake tube and bracket, maximizes air velocity providing maximum performance and throttle response. This is a direct bolt-on kit that requires no cutting or drilling on OEM parts. This dyno tested intake tube is designed to maximize air velocity and uses the latest engineering tools for maximum performance. This large intake tube is mandrel-bent to smoothly direct the increased airflow into the engine. This intake utilizes a huge, 7" conical Pro DRY S Filter. This filter features 3-layers of progressively finer mesh synthetic "oil-free" media to provide maximum flow with excellent filtration. The progressive layering of media allows the filter to flow at high levels, even when dirty. The Pro DRY S non-oiled synthetic air filter requires no oils for cleaning for maximum convenience. OR you can get the Pro 5R oiled filter for maximum flow compared to the Pro Dry S, but with reoiling maintenance as a small setback for the performance increase. So if you're ready to pick up a new AFE Magnum FORCE Intake System Pro 5R/Pro Dry S for your BMW F30 328i with L4 2.0L N20 motor, give ModBargains a call at 714-582-3330. Our Modification Experts are ready to help with any questions or orders you may have.